If you’re a movie freak like me you probably have a fantasy list of movies that you wish were properly released on DVD. Sure, lots of movies and shows can be attained by buying bootleg versions on the Internet, but most of them have questionable quality and simply lack the sheen of an official release. As silly as it may sound, numero uno on my list is ’80s TV series It’s A Living starring Ann Jillian. At some point during the rest of my life, I want to be able to own the complete series on DVD. As mentioned by Gail Edwards, one of the shows stars on her website, the DVD may never come out because there are around 300+ songs used that the release company would have to pay to use. So, it looks like I won’t be getting my fill of my favorite waitresses unless people miraculously read this and start clamoring for the DVD, which is highly unlikely. Oh well, I still have the memories. Play it for me Sonny! In the first edition of GGG I mentioned how I wasn’t impressed at all by the new Doritos Jacked chips. Over the summer I did find a new version of Doritos called Dinamita at Walmart that made up for them a little bit. The chip is rolled up like a taquito and is a few levels spicier and packs a bit more heat than usual. The question I find myself asking – why can’t they just keep making the few flavors of traditional Doritos? Why keep screwing with a good thing? 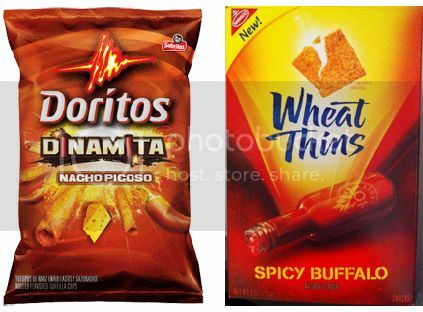 What I enjoyed more than both of these Doritos versions were Wheat Thins Spicy Buffalo. I love these so much. Definitely try them if you are a fan of both Wheat Thins and buffalo flavor. My shall we say fondness for Monster High dolls is about as well kept a secret as our former New Jersey Governor Jim McGreevy being gay. Hiding the fact that I love these macabre looking dolls is futile. I was immediately drawn to them when they came out 2 years ago. They are a perfect way to slyly incorporate the Universal Monsters into a kids toy line. They were released at the most perfect time too – I was actually thinking of starting to buy a few Living Dead Dolls at Monster Mania and Chiller to add to the collection, but luckily these came along. At first I tried to get my niece into them, but she didn’t seem too crazy about them. At this point I don’t own more than a few, but the latest one I picked up a few months back is my absolute favorite. In fact, if I had to part with the others that I have, this black and white Frankie Stein Skull Shores edition is quite enough for me. Certain things make people geek out. For me, it’s usually the little things that make me flip. As a kid all that needed to happen for me to go ballistic was getting an action figure that I always wanted and couldn’t seem to find. Back then it was a $3 dollar piece of plastic or rubber and I was a happy camper. Now my elation is even cheaper – it’s FREE! It comes in the form of a simple re-tweet or reply on Twitter from people I have basically idolized or have had a crushes on. Sure I’ve had retweets/replies from a ton of cool people, but over the summer 2 retweets managed to make my whole year. Probably one of the longest crushes I’ve had on a celebrity is with Audrey Landers of Dallas fame and the film version of A Chorus Line. Ever since I was a kid I’ve been crazy about her. She replied to me after I sent her out a tweet saying that the new Dallas on TNT should have her back on the show. After a nice “thank you” reply I asked her if she would ever consider appearing at Chiller Theatre con in NJ and well what do you know? She and her sister will be at Chiller in October! Hopefully I’ll make it to her table without having my heart beat right out of my chest. Getting retweeted by the walking condominium himself King Kong Bundy was a real avalanche into the turnbuckle. The legendary wrestling heel, Bundy, hails from Atlantic City, NJ. As a little wrestling fan in the ’80s, Bundy was one scary mofo in my eyes. He had a huge dominant presence and was one of the few guys who could legitimately scare people. After headlining Wrestlemania 2 and popping up in a memorable mixed tag match in Wrestlemania 3, Bundy returned to WWE in ’94. I was always a big fan of his and a retweet from him is something I’d love to go back in time and tell my young self about. Bundy retweeted the Instagram of me posted above in my King Kong Bundy T-Shirt standing on the Atlantic City boardwalk, the site of Wrestlemanias 4 and 5. ← Bumper Car Psychos in Keansburg, NJ!